More London is the could-do-better new development of the usual eateries, open spaces and largely unremarkable office buildings on the southbank just west of City Hall. It does try hard though and has some interesting bits like the water feature running the length of the dramatic diagonal pedestrian conduit between Tooley Street and the river. The developers have also planted a swathe of North American tree species including Liriodendron Tulipifera – the Tulip Tree, Quercus Rubra – the Red Oak and Betula Papyriera – the Paper Birch. I wonder why they chose these species over native ones? Particularly the Red Oak which while undoubtedly a handsome tree and mildly exotic with its large serrated leaves has none of the character of native Oaks. 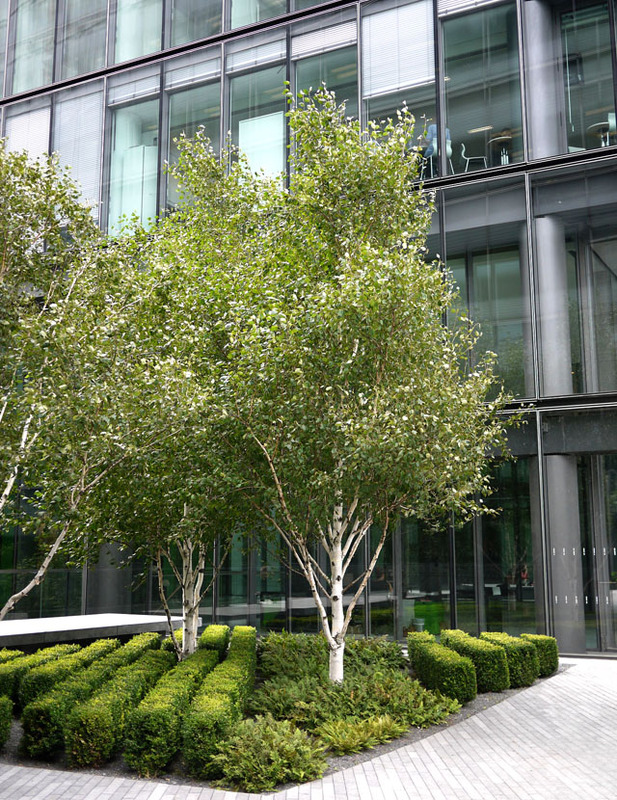 It’s straight, business-like stature – particularly evident in these young nursery-nurtured trees – mirrors the buildings and their daytime inhabitants. The irony is that the beauty of this tree in its native New World is surely its fiery autumn colours which in our damper and milder oceanic climate is watered down from a rich red to a pedestrian caramel brown. I like to think there was more imagination behind the selection of the Paper Birch as one of the other species used in the landscaping. Like the European Silver Birch, Paper Birch is a pioneer coloniser of marginal land and was prized by native Americans for its use in the construction of canoes. So, well done developers for making an interesting open space and ensuring there’s lots of greenery (I particularly like the shady planted rows of Box hedging under an Oak canopy interspersed with stone benches), but wouldn’t the whole development have been more characterful and perhaps had more of a sense of place if the planted trees were the familiar native Oak and Birch?